What is CR-S*F type Cable Gland? Cable Glands type “CR-S*F”, used in any orientation, are certified Flameproof Ex d, Increased Safety Ex e, Restricted Breathing Ex nR and Dust Protected Ex ta. They are suitable for use in Group I Mining, Zone 1 and 2 for Gas Groups IIA, IIB and IIC and additionally for use in Zones 20, 21 and 22 for Dust Groups IIIA, IIIB and IIIC. Commonly referred to as a “Conduit Stopper Box”, they are suitable for use with conductors carried in conduit or as a line bushing for terminating flying leads. These glands provide a compound barrier Ex d & IP seal on the cable inner cores, eliminating damage to cables that exhibit “cold flow” characteristics. 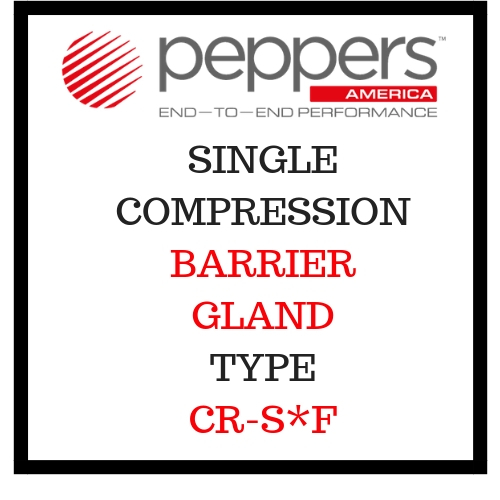 The unique features include Peppers T-1000, the sealing compound that enables a quick and easy installation and an innovative barrier chamber that allows for a full inspection of the compound fill. These glands maintain IP66 & IP68 to 100 metres and are deluge proof without the use of an additional seal or deluge boot. It is supplied with an IP O-ring seal as standard on metric entry threads. This gland is supplied with a female conduit connection thread. At 21°C, conductor termination can be effected after 1 hour. The compound chamber can be fully inspected after 4 hours and the equipment then energised. • Gland size does not necessarily equate to the entry thread size. • The IP O-ring seal is only available on metric entry threads. IP washers can be supplied for tapered entry threads. • Dimensions (A) & (B) may differ for glands with non metric entry threads. Please refer to our “Thread Reference Tables” for specific dimensions. • Assembly instructions must be read prior to installation and adhered to in full. • Peppers supply cable glands with parallel entry threads that conform to the flameproof threaded joint requirements of IEC/EN 60079-1 and other equivalent standards. They usually incorporate a thread run out according to the available machining techniques and will not have a full form thread for the entire length. How do you Install CR-S*F Gland?